I don’t know about you guys, but apparently Fall is here in Oregon. It turned fast, too. One week it was in the high 80’s, clear skies, great weather, and the next day it was pouring buckets, there were windstorms and gray skies. I’m so not ready yet! But looking at the weather forecast, it didn’t seem like summer would be returning. I packed all my tank tops into the spare closet and pulled out my sweaters. Boo. In other Fall news, I tried canning for the first time! It was on sale and also had a $2 off coupon so for $10 I got to try canning for the first time and not feel like I had to make a huge investment. I had a huge tub of roma tomatoes. 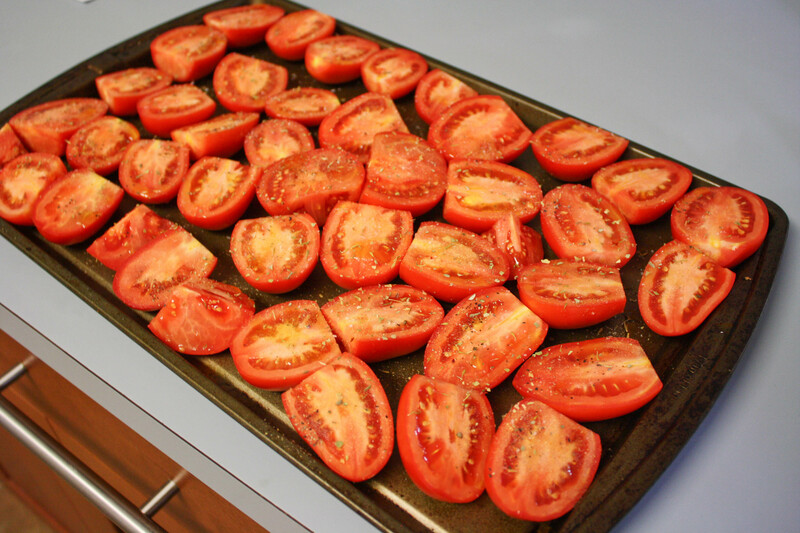 First I cut the tomatoes in half and then laid them on a pan for roasting. 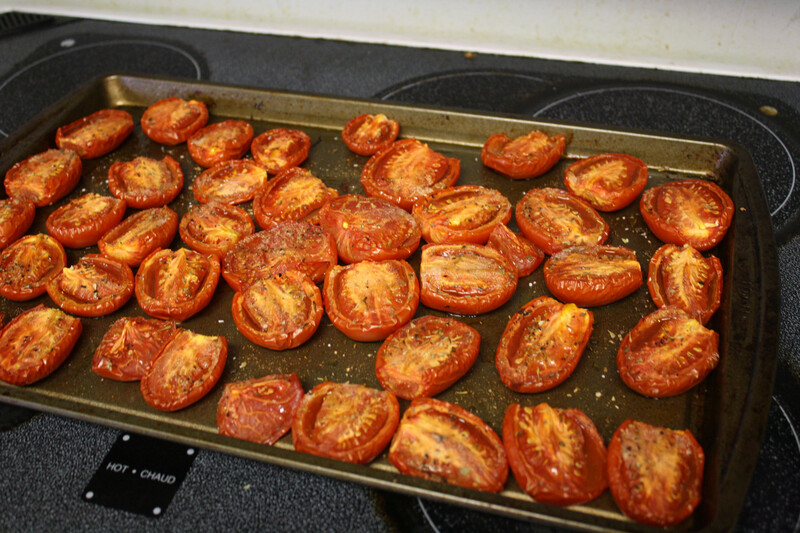 I sprinkled the tomatoes with olive oil, salt, pepper and some Italian seasoning and roasted them for the full 2 hours. They looked gorgeous when they were done! In 2 (13 by 9-inch) pans place tomato halves cut side up. Sprinkle with oil, salt and pepper, onion, garlic, and herbs. Bake tomatoes for 2 hours. 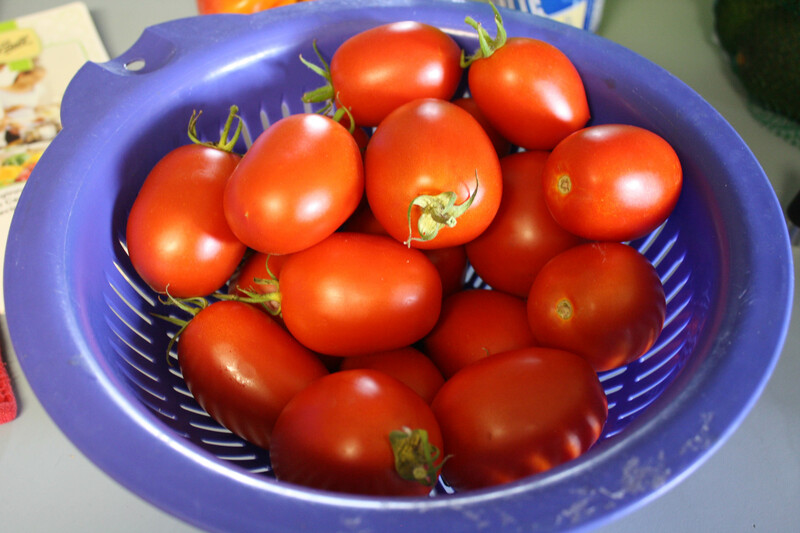 Check the tomatoes after 1 hour and turn down the heat if they seem to be cooking too quickly. Then turn the oven to 400 degrees and bake another 30 minutes. 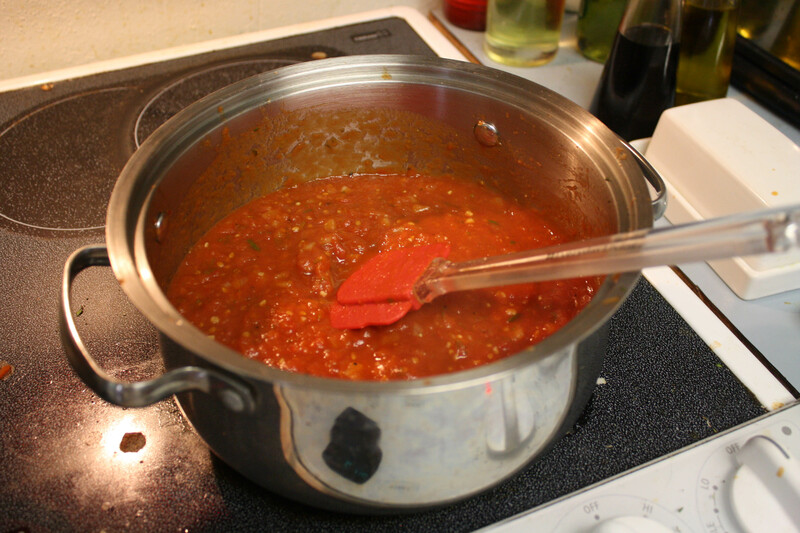 Remove from the oven and process tomatoes through a food mill on medium dye setting over a small saucepan. Discard skins. Add white wine, bring to a boil, reduce heat to low and cook for 5 minutes. I didn’t have a food mill, so I tried to get the seeds out the best I could but kind of failed. Oh well. It didn’t hurt the sauce in any way. The skins were super easy to get off. I pureed it in the food mixer a little but but left it kind of chunky. Then into the pot to cook. I added a ton of fresh herbs from my garden–oregano, rosemary, basil and some pineapple sage. I also added some dried Italian spices (thyme and marjoram). If I had to do it all over again, I would sautee the diced onion and garlic for a few minutes before adding it to the sauce. Lesson learned! It didn’t affect the taste of the sauce at all, but I think cooking down the onions would be better. Just for future reference. 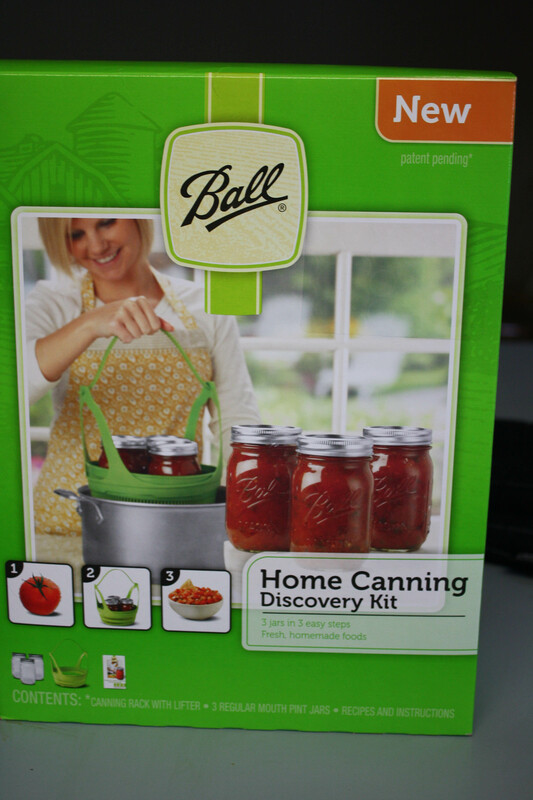 Now onto the canning part…Thankfully my little packet came with an easy guidebook (with recipes too). I had already cleaned the jars and then just had to heat them up. It was awesome that I’d also inadvertently made nearly the perfect amount for the three jars! And it sealed! Woot!!! First experience canning was a success!! At least it looks that way. Who knows 5 months from now when I take the sauce out of the pantry…cross your fingers! If it IS a success, I will definitely do much much more next year. Well, wait a second…I’ll be getting married this time next year so probably not canning….but maybe earlier in the summer I can. Anyways, I was happy that I finally tried canning! I might have to practice doing more this winter…..
Are you a canner? Any tips? Now that I’ve done it, it’s not as scary and I want to can some more stuff! That sauce looks delicious!! I’ve never tried canning, but I like to batch cook a lot since I really don’t enjoy spending a lot of time in the kitchen. It seems to me that canning is fancy batch cooking, so I’ll have to try sometime! Ashleigh @ Passion for Life, Love, and Health recently posted..What Does the Name of Your Blog Mean? Some day I will do that, too. What my plan is, is to get a freezer for the garage to put the proteins we buy from Costco and also freezer meals. I want to do the thing where you pre-make a bunch of crockpot meals and just pop them in! 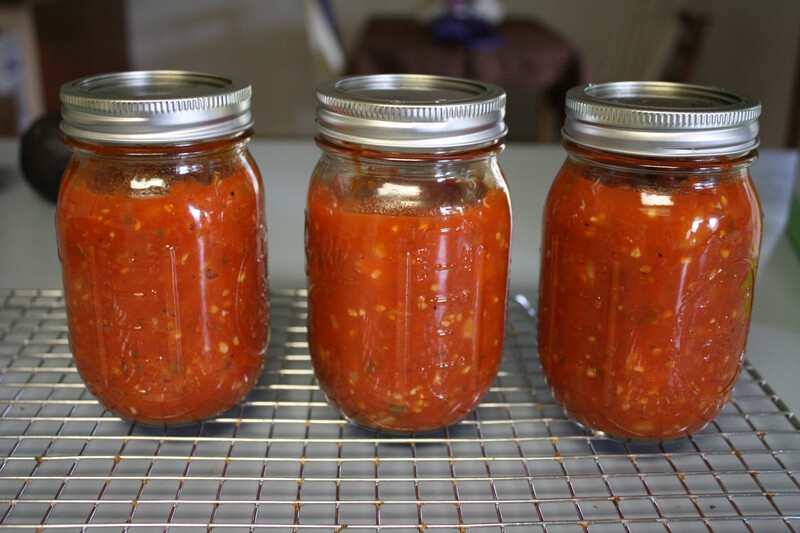 I grew up canning – we canned everything from apples, green beans, tomato sauce, etc., so it’s in my blood. I was lucky to stumble upon a woman at a garage sale that sold me her WHOLE canning supply stuff for just $20 bucks, which INCLUDED about 50 jars! You can’t reuse the rings and lids, but obviously you can reuse the jars. I actually sanitize the jars in my dishwasher by themselves – and the rings and lids in hot water in a pot on the stove. It’s so sad by December when I open my last jar of salsa! Great job! Biz recently posted..I’ll take every Monday off please. I bet garage sales are a great place to get mason jars. I adore tomatoes and have never done any canning. I didn’t know that they had kits like that! I didn’t either. It was nice to find. I really don’t want to tell you this, but I’m worried that recipe isn’t safe for canning. Did you add any lemon juice or anything to your jars? I’m not sure that the ph level in the sauce is within the necessary amounts. A great resource is http://foodinjars.com/. You did mention that you had a recipe book in the Ball kit that came in and that may have something that you followed to be sure the recipe is safe. If you are concerned about it, you can just freeze the jars as is and they will be fine. Well bummer. Wish I’d known that before! I’m sorry! I feel really bad for pointing it out but better I feel bad then you get sick right. 🙁 I hope your next experience is better. I love canning! No I appreciate it! I need all the help I can get. I put the jars in the freezer. Which is fine, because I told myself if the canning didn’t work, I’d just freeze it and I bought a bunch of tupperware for it. Hopefully the jars are ok in the freezer. I was going to suggest freezing them! Courtney was right to point out the risk, and to recommend Food in Jars – it’s a great resource! But yes, it’s very important to follow the rules when canning, if you’re going to leave the product on the shelf for a while. Still, you have the mechanics down now, so off to a great start! p.s. it’s my fault about fall – I made an amazing Goodbye Summer cake on Sunday and it promptly got crappy out. Oops! Canning has been on my “to-do list” for years, but I still haven’t done it. I even bought a book, but it seemed all a bit complicated. Your tomato sauce sounds great! It’s been on my list forever too. The leaves are just turning here but the weather is very fall like…just wonderful. I was planning to attempt some canning this weekend, but alas a wisdom tooth decided it had to come out. I’m planning on some practice canning in October. I will try this sauce recipe. It just looks yummy. I love making jam. In fact, I have to make some strawberry jam tomorrow since they were on sale and I bought a lot! Canning is pretty specific in terms of recipes. 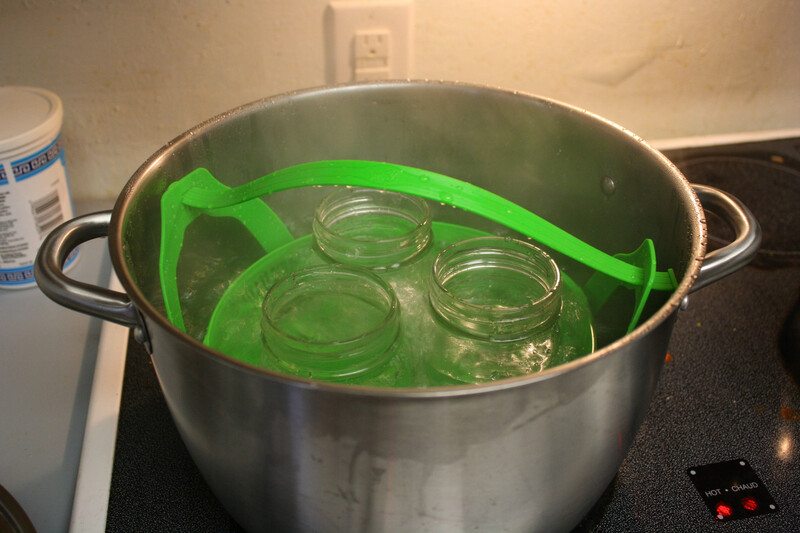 Did your water cover the top of the jars when you put them back in the water bath? The water is supposed to cover the jars by an inch when processing. I have a big stock pot I use for canning, which can let me process 6 or 7 jars at a time. Once you get the hang of canning and understand the science behind it – you will get addicted! Yep, I had the water cover the top. It also sealed like it was supposed to. Apparently I was supposed to add lemon juice. Oh well. I popped them into the freezer. lesson learned! I bet that sauce will be amazing! Coco recently posted..I’m Heading To The FitSocial 2013 Conference! I LOVE canning, jamming and jarring!!!! Once you get the hang on it, its hard to stop! Roz@weightingfor50 recently posted..H is for…. I want to practice some more.